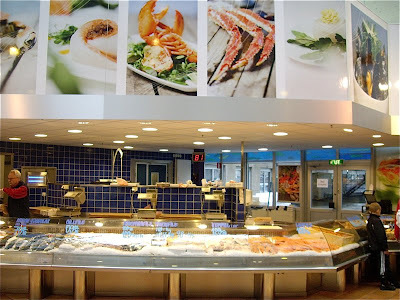 A love a well stocked fish monger, and one of the best I have seen is Feskarbröderna located in Nordstan in Göteborg. It is great to see so many specialties under offer, based on freshly caught produce found in the ocean just outside the city. 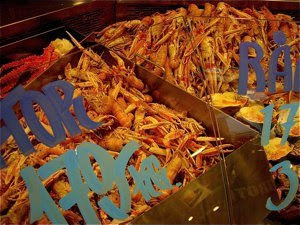 Norway lobster is the mini baby brother of the European lobster. It is red, not black, and far less expensive. You will pay up to €20-30 for a kilo., i.e. 6-10 lobsters They are absolutely delicious prepared raw on the BBQ or halved, baked in the oven with garlic butter or other marinades. For those of you that buy Norwegian smoked salmon, it would be interesting to know that there are so many varieties of this smoked specialty. Producers are constantly experimenting to create new interesting products. 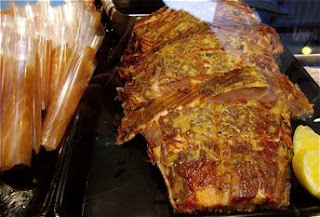 They either add different woods to create richer and more interesting smoke aromas, or add flavour by marinating the fish i.e. in aquavit. This means that there are increasingly number of new intriguing products to choose from, as e.g. this salmon under offer. See recipe for open sandwich with akvavit marinated smoked salmon with creamed scrambled eggs with Dijon mustard and tarragon. Smörgåstårta or open sandwich cake is a Swedish specialty. The sponge in a cream cake has been substituted with white bread baked in a cake tin. 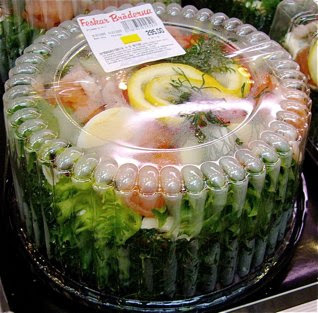 The bread is sliced in the same way, and is layered with prawns, salmon, asparagus, eggs, and other delicacies, topped with mayonnaise. You may also make a Smörgåstårta with meat as well. At Feskarbröderna you find a cake made from seafood. At SEK 295 or €27 you get a lot for your money. Enjoy it with a good pint of beer and an akvavit.